Browsing Category "CURRENT AFFAIRS FOR SSB"
created this book for your SSB interview preparation as well as All general competition exams of Banks,SSC, Railways, DMRC and Delhi Police etc The downloading link is at the bottom of page. Keep visiting for more updates. A World Economic Forum (WEF) on 5 May released its 13th edition of Global Information Technology Report. In the report’s networked readiness index Scandinavian countries dominated the top 10, with Finland grabbing the top spot, followed by Singapore, Sweden, the Netherlands, Norway, Switzerland, the United States, Hong Kong, Great Britain and the Republic of Korea. In the developing world, China fell four spots to No. 62, Brazil fell nine spots to No. 69 and India dropped 15 spots to No. 83 in terms of leveraging information and communications technologies for growth and well being. 47 nations including Switzerland and India, have agreed upon automatic exchange of information on tax matters.The endorsement of the ‘Declaration on Automatic Exchange of Information in Tax Matters’ by 47 countries under the aegis of Organisation for Economic Cooperation and Development (OECD) on 6 May will come as a boost for India, which is stepping up pressure on Switzerland to share details on alleged illicit funds stashed away by Indians there. According to the report released by US Immigration and Customs Enforcement (ICE) on 7 May, India accounts for second largest number of international students in this country. China with 290,133 students is at the top in the report on international students. The Odisha government has on 14 May signed an agreement with the TiE Silicon Valley as part of its efforts to develop the state as an IT hub and attract US investment. Under the agreement, Odisha government would have a professional stationed at the headquarters of Silicon Valley in Santa Clara, California. The Supreme Court on 6 May upheld the Constitutional validity of the Right to Education (RTE) Act. In its decision, the apex court explained that the Act is not applied to unaided minority institutions. The five-judge Constitutional Bench of the Supreme Court in its decision also upheld the provisions of the Right of Children to Free and Compulsory Education Act 2009 and the Right of Children to Free and Compulsory Education Rules, 2010. The government has extended by five years the ban imposed on LTTE, a terror group that was behind the assassination of Rajiv Gandhi and was decimated by the Sri Lanka military in 2009. India had banned Liberation Tigers of Tamil Eelam (LTTE) after the assassination of Gandhi in 1991. The declaration of LTTE as an ‘Unlawful Association’ has been extended for a further period of five years with effect from 14 May 2014. The Indian general election of 2014 was held to constitute the 16th Lok Sabha, electing members of parliament to all 543 parliamentary constituencies of India. Running in nine phases from 7 April to 12 May 2014, this was the longest election in the country’s history. The results of the 2014 Lok Sabha election were declared on 16 May 2014. In the Elections 2014, The National Democratic Alliance (NDA), led by the Bharatiya Janata Party (BJP), won a sweeping victory, taking 336 seats. The BJP itself won 282 seats, the first time since Rajiv Gandhi’s landslide victory in 1984 that an Indian party has won enough seats to govern without the support of other parties. The United Progressive Alliance (UPA), led by the Indian National Congress (INC), won 59 seats, 44 of which were won by the Congress. President Pranab Mukherjee dissolved the 15th Lok Sabha on 18 May. President dissolved the Lok Sabha on the advice of outgoing Union Cabinet led by Prime Minister Manmohan Singh who resigned on 17 May 2014. Union Cabinet recommended the President to dissolve the 15th Lok Sabha as a follow up to the election results of 16th Lok Sabha election. This will make way to the formation of new government. The Supreme Court has on 7 May banned centuries-old Jallikattu- bullfights and bullock-cart racing- organised during festivals in Tamil Nadu and neighbouring states.Significantly, the bench headed by Justice K.S. Radhakrishnan favoured elevating the rights of the animals to constitutional rights. The ruling Biju Janata Dal (BJD) in Odisha under the leadership of Chief Minister Naveen Patnaik established a landslide victory in the 2014 election leaving opposition Congress and BJP reduced to a miniscule. The results for the elections were announced on 16 May 2014 in which BJD claimed more than two-third majority by winning 117 of the total 147 seats. Congress had won a clear majority in the Assembly elections by winning 42 of the total 60 seats. BJP won 11 seats and was followed by People’s Party of Arunachal (PPA) with 5 seats. Remaining seats were shared by independent candidates. The results for state’s Assembly elections were announced on 16 May 2014. Sikkim Chief Minister Pawan Chamling -led Sikkim Democratic Front (SDF) won 18 of the 22 seats in the 32-member state assembly.The assembly election results were declared on 16 May. SDF won its fifth consecutive term in the assembly elections. The Opposition, Sikkim Krantikari Morcha, has got the remaining 10 seats. The 47th Annual Meeting of Asian Development Bank (ADB) Board of Governors was held from 2-5 May 2014 in Astana, the capital of Kazakhstan. The meeting was attended by Finance Ministers/their representatives of 67 Member Countries. Discussions were conducted on economic development forecasts of the Asia-Pacific region, new economic challenges for the region and other issues, and significance of interaction in solution of problems important for the continent was emphasized at the event. Ravinder Dahiya, an Indian scientist in Britain, has been granted a prestigious fellowship worth 1,068,000 pounds (around $1.8 million) on 2 May by a top British agency that funds research in engineering and the physical sciences. Two Indian-origin chefs Vikram Sunderam and Vishwesh Bhatt have been conferred with the prestigious James Beard Food Awards for 2014, considered as the Oscars of the US food and beverage industry. Sunderam and Bhatt were awarded the Best Chef in the Mid-Atlantic and Best Chef in South respectively. The James Beard Food Awards, which were presented during a ceremony at the Lincoln Centre at the James Beard Foundation’s annual awards ceremony in New York on 5 May, are widely considered the top honours in American cooking. Six Indian Americans have been felicitated on 10 May with the prestigious Ellis Island Medal of Honor for the year 2014.The Ellis Island Medals of Honor by the National Ethnic Coalition of Organization is given annually to US citizens who have distinguished themselves within their own ethnic groups while exemplifying the values of the American way of life. Among the recipients of the award are Yash Paul Soi , Narpat Bhandari , Samir Desai , Arun Kumar Pramanik , Ketki Sharadkumar Shah , Abdul M Suleman, were also felicitated with the prestigious award. Winter Sleep, a film by Turkish director Nuri Bilge Ceylan, was honoured with Palme d’Or Award at the 67th Cannes Film Festival held in Cannes from 16 May to 25 May 2014. Julianne Moore won the Best Actress prize for ‘ Maps to the Stars ‘, while ‘ Turner’ star Timothy Spall was named Best Actor. India’s Sania Mirza and her Zimbabwean partner Cara Black won their first WTA title of the season beating Eva Hrdinova (Czech) and Valeria Solovyeva (Russia) in the women’s doubles final of the Portugal Open in Oeiras (Portugal) on 3 May 2014. Mercedes driver Lewis Hamilton of Great Britain won the Spanish Grand Prix on 11 May. This was Lewis Hamilton’s fourth consecutive victory in 2014 F1 season for his team Mercedes. Men’s Singles :- Novak Djokovic of Serbia won the Italian Open men’s singles tennis title (Rome Open Tennis) on 18 May in Rome, Italy. He defeated Rafael Nadal of Spain in the final. It was his third Italian Open title. Women’s Singles :- Serena Williams of US won the women’s singles title after defeated Sara Errani of Italy in the final. It was her 3rd Italian Open title. China won the Badminton’s Uber Cup 2014 on 24 May. China successfully defended its title by scoring an emphatic 3-1 win over Japan. It was China’s 13th Uber Cup title, the most by any team.Uber Cup is often known as the World team championship for women’s badminton. Minors above 10 years of age can open and operate independently savings bank account and use other facilities like ATM and cheque books. The Reserve Bank on 6 May issued the guidelines allowing minors to operate bank accounts independently with a view to promote financial inclusion and bring uniformity in opening of such accounts in banks. Mukesh Ambani-led Reliance Industries Ltd (RIL) leads the pack of 54 Indian companies on Forbes’ 11th annual list of the world’s 2000 largest and most powerful public companies. The list was released on 7 May. India has 54 of the world’s biggest companies. RIL is ranked 135, with a market value of $50.9 billion and $72.8 billion in sales as of May. President Pranab Mukherjee has dedicated ‘RuPay’ India’s own card payment network to the nation on 8 May. The system has been developed by National Payment Corporation Ltd (NPCL). RuPay is India’s own card payment network just like Visa and Master Card and provides an alternative system for banks to provide debit card service. Nine Indian firms have made it into the Forbes list of the World’s 100 most innovative growth companies. New Zealand software accounting firm Xero topped the list. Among the nine Indian companies, Godrej Consumer Products leads the pack and was ranked 31st globally with an enterprise value of $4.25 billion. The list was released on 22 May 2014. India on 4 May successfully test-fired its first indigenously-developed air-to-air missile ‘ Astra ‘ from a Russian-built Sukhoi Su-30MKI fighter jet over the Arabian Sea off Goa. Astra is India’s first Beyond Visual Range (BVR) Air-to-Air missile. It was designed and developed indigenously by the Defence Research and Development Organisation (DRDO) . Paediatric pentavalent vaccine ‘Shan5’, developed and manufactured by Hyderabad – based Shantha Biotechnics, an affiliate of French pharmaceutical company Sanofi, has regained prequalification (PQ) status on 5 May from the World Health Organisation (WHO). This status qualifies the vaccine, which provides protection for children against diphtheria, tetanus, pertussis, Hib and hepatitis B, for purchase by United Nations agencies, governments and other organisations. The world’s first wireless pacemaker, developed by Indian-origin scientist Dr Vivek Reddy, Director of Arrhythmia Services at The Mount Sinai Hospital in New York. The device is only a few centimeters in length, making it less than ten per cent the size of a traditional pacemaker. A research project named “Solar-Jet” funded by the European Union has produced the world’s first jet fuel from water and carbon dioxide.In the Solar-Jet Project, researchers used concentrated light-stimulated sunlight-to convert carbondioxide and water to synthesis Gas in a high temperature solar reactor containing metal-oxide based material developed at ETH Zurich. Veteran Congress leader Nabam Tuk was sworn in as the Chief Minister of Arunachal Pradesh for the second consecutive term at the Raj Bhavan in Itanagar on 18 May. He is the 8th (seventh as person) Chief Minister of Arunachal Pradesh. Janata Dal (United) leader Jitan Ram Manjhi was on 20 May sworn in as Bihar’s 23rd Chief Minister. Manjhi was SC/ST welfare minister under former CM Nitish Kumar who resigned owning responsibility for the poor performance of JD (U) in the parliamentary polls. Biju Janata Dal (BJD) president Naveen Patnaik was on 21 May sworn in as Odisha chief minister for the fourth straight term. He is the 14th Chief Minister of Odisha. Naveen Patnaik won a huge victory in both the 2014 Indian General Elections and the Legislative Assembly of Odisha elections in 2014. Anandiben Patel was sworn-in on 22 May as Gujarat’s first woman and overall 15th Chief Minister in a ceremony chaired by state Governor Kamala Beniwal. Anandiben Patel was appointed as the new Chief Minister of Gujarat after Narendra Modi resigned from the office on 21 May 2014. Three-time Chief Minister of Nagaland Neiphiu Rio on 23 May resigned from the chair along with his council of ministers. Neiphiu Rio, who has been chief minister of Nagaland for over 11 years, tendered his resignation following his landslide victory in the 16th Lok Sabha polls. Gary Becker, whose work applying the principles of economics to a wide range of human behavior won the Nobel Prize in 1992, has died on 3 May in Chicago. He was professor of economics and sociology at the University of Chicago. American economist, Becker received the Nobel Prize in 1992 in economics for using economics to analyse human behaviour and interaction topics such as crime (why people commit it), discrimination against minorities and family life. Turkmenistan President Gurbanguly Berdymukhamedov visited China from 11 – 14 May 2014. During his four day visit, Berdymukhamedov met China Prime Minister Li Keqiang in Beijing, capital of China. Both nations signed a number of deals to develop a stronger strategic partnership. The two heads of states also witnessed the signing of several cooperation agreements in areas such as natural gas, agriculture, transportation, finance, culture and local exchanges. An 11-year-old boy in the UK has achieved the highest possible score of 162 on a Mensa IQ test, making him brainier than physicist Albert Einstein. Ramarni Wilfred, of Loom Grove, Romford, took the Mensa IQ test at Birbeck University and achieved a score of 162. Although Einstein never took an IQ test as none of the modern intelligence tests existed during the course of his life, experts believe he had an IQ of around 160. The world’s highest tunnel for high-speed trains in northwest China at an altitude of 3,607.4 metres became operational on 1 May. The 16.3-km-long was completely linked up, operationalising the line linking Gansu Province and Xinjiang provinces. With altitudes of up to 3,607.4 metres, the tunnel passes through the Qilian Mountains with two sections and a bridge. The construction of the highest tunnel started in 2009. The Vice President of India, M. Hamid Ansari released a book entitled “A Stamp is Born” authored by C. R. Pakrashi, a renowned stamp designer, at a function on 6 May. The author Pakrashi, who is also a renowned Stamp designer in the book, has described his first-hand experiences with all stages of production of the stamp right from conception to final execution and printing. The book includes 56 commemorative stamps. The Reserve Bank of India (RBI) committee report has recommended on 13 May that the government should divest its stake in state-owned banks to less than 50%, allow private equity houses to own 40% in distressed banks, and strip managers of private sector banks of their bonuses and Esops if they are caught ever-greening sticky loans. The report covers 27 state-controlled lenders. The committee was led by P. Jayendra Nayak, the former chief executive of Axis Bank Ltd. and former India country head of Morgan Stanley. Anti-Terrorism Day observed Across India on 21 May 2014. The day is celebrated as 23rd Death Anniversary of former Prime Minister of India Rajiv Gandhi.The day is marked by a pledge taking ceremony among other activities.The objective behind the observance of Anti-Terrorism Day is to wean away the people from terrorism and violence. On the occasion, debates, discussions, symposia, seminars, lectures, etc. are held in schools, colleges and universities on the dangers of terrorism and violence.The Day is observed to generate awareness in the country among all sections of people, about the danger of terrorism. World Press Freedom Day was observed on 3 May 2014 across the world. The theme of 2014 year is: Media Freedom for a Better Future: Shaping the post-2015 Development Agenda.The focus this year is on three inter-related themes: the media’s importance in development; the safety of journalists and the rule of law; and the sustainability and integrity of journalism. I am putting a very best book of current affairs for April: 2014. The book consist of all important current affairs- national, International and sports in short, precise and best way. 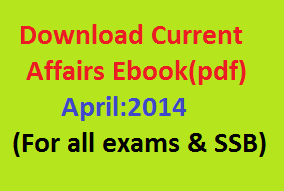 Download current affairs April: 2014 e-book for free. This book is made keeping in mind, the needs of SSB aspirants. Increase your General Awareness for SSB Interview and If you are preparing for general competition- SSC, Banking, Civil services, UPSC, NDA, CDS,IBPS, DELHI/UP POLICE then this book will help you alot. Kazakhstan President Nursultan Nazarbayev named his chief of staff Karim Massimov as the new prime minister on 2 April. His appointment came following the resignation of Serik Akhmetov from the post, which was accepted by the President as per the Constitutional provision. Viktor Orban was re-elected to a third term as Prime Minister of Hungary .The results of general elections were announced on 8 April 2014. The General parliamentary elections were held on 6 April 2014.Out of the total votes casted, Orban’s Fidesz party won 133 of 199 parliament seats. China’s capital Beijing is on 9 April taking a novel approach to protecting doctors from growing levels of violence from angry patients: volunteer “Guardian Angels”.The campaign will recruit students, medical workers and other patients to act as middlemen between doctors and those in their care to defuse disagreements and smooth over tensions. A new law legalizing sale of self-testing kits for HIV came into force in United Kingdom (UK) on 6 April 2014. The new law allows individuals to buy the self-testing kits available on shops and self-diagnose for HIV at home itself. I am putting a very best set current affairs for March: 2014. The book consist of all important current affairs- national, International and sports in short, precise and best way. Download current affairs March: 2014 e-book for free. This book is made keeping in mind, the needs of SSB aspirants. Increase your General Awareness for SSB Interview and If you are preparing for general competition- SSC, Banking, Civil services, UPSC, NDA, CDS,IBPS, DELHI/UP POLICE then this book will help you alot. The World Bank announced on 11 March that it will provide up to $3 billion to support reforms in Ukraine, which is struggling to put its economy back on track amid political turbulence.The lender explained that restoring economic stability, strengthening the banking sector, reforming the energy sector, tackling corruption, enhancing investment and improving social assistance were key priorities for Ukraine.The pledged assistance comes on top of existing cooperation between Ukraine and the bank. Former leftist rebel commander Salvador Sanchez Ceren has won El Salvador’s presidential election by a razor-thin margin. His conservative opponent, Norman Quijano, has vowed to challenge the official results.The El Salvador’s Supreme Electoral Tribunal (TSE) on 17 March 2014 officially declared Sanchez Ceren the winner of the Central American nation’s presidential election by a margin of just 7,000 votes. He secured 50.1 percent of the ballot compared to 49.9 percent for Quijano. I am putting a very best book for current affairs for february: 2014. The book consist of all important current affairs- national, International and sports in short, precise and best way. Download current affairs February: 2014 e-book for free. This book is made keeping in mind, the needs of SSB aspirants. Increase your General Awareness for SSB Interview and If you are preparing for general competition- SSC, Banking, Civil services, UPSC, NDA, CDS,IBPS, DELHI/UP POLICE then this book will help you alot. Chemical Weapons Convention, Foreign Minister Mohamed Abdelaziz announced on 5 February.Now the Libya has become totally free of usable chemical weapons that might present a potential threat to the security of local communities, the environment and neighbouring areas. I am putting a very best book for current affairs for January: 2014. The book consist of all important current affairs- national, International and sports in short, precise and best way. Download current affairs January: 2014 e-book for free. This book is made keeping in mind, the needs of SSB aspirants. Increase your General Awareness for SSB Interview and If you are preparing for general competition- SSC, Banking, Civil services, UPSC, NDA, CDS,IBPS, DELHI/UP POLICE then this book will help you alot. Colorado has on 1 January become the first U.S. state to license the sale of the drug for recreational use. In November 2012, Colorado voters approved the sale of recreational marijuana, as did voters in Washington state. Under the new state law, residents are now able to buy marijuana like alcohol.